As my colleague Yann said in an earlier blog, there is a growing shortage of multilayer ceramic capacitors (MLCCs), and the situation is likely to persist through 2020. MLCCs are used in almost every type of electronic equipment, due to their reliability and small footprint. Manufacturers are now looking to replace ceramic capacitors with polymer or other capacitor types. TI D-CAP+™ control mode multiphase controllers, converters and modules (like the TPSM831D31) can help hardware designers reduce the MLCC count on their motherboard versus competitive solutions. D-CAP+ control mode is a TI proprietary pulse-width modulation controller and converter control architecture that enables very easy loop compensation and excellent loop stability in the presence of varying conditions such as input voltage and the number of phases. It is a current-mode constant on-time control that uses a true inductor current-sense implementation rather than the injected or emulated ripple current schemes used in the D-CAP2™ and D-CAP3™ control topologies. The D-CAP+ control mode has fixed on-time in steady state and adaptive on-time during load transient condition (AC response), in which the field-effect transistor switch rapidly adjusts as the input and output voltage change to maintain a constant overall switching frequency. Because D-CAP+ control mode can respond much faster to a processor/application-specific integrated circuit/field-programmable gate array load transient than a fixed-frequency control architecture, it can meet tight tolerance specifications without the number of MLCCs that you would otherwise need for discharging or charging to provide the required energy to the load. 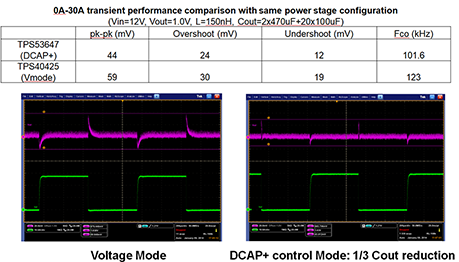 Figure 1 compares a TI voltage-mode controller vs. a D-CAP+ controller during such a load transient. The TPS53647 D-CAP+ control-mode controller has lower overshoot and undershoot, despite having a lower crossover frequency. The results are similar when making comparisons to competing multiphase controllers with non-D-CAP+ control. Figure 2 compares a 60-A load step from 180 A to 240 A at a 1-kHz load transient repetition rate. The D-CAP+ controller, again, results in lower overshoot and undershoot. These results were replicated on the same motherboard under the exact same conditions. 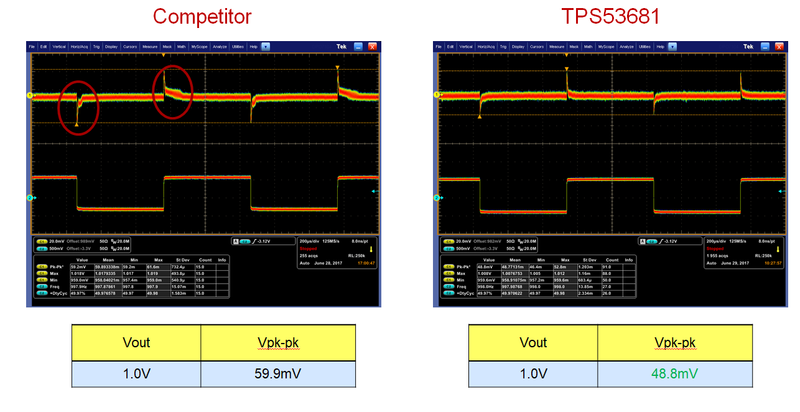 The TPS53681 D-CAP+ controller can achieve better load transient response and faster output voltage settling. As a final example, let’s compare a central processing unit (CPU) vendor’s reference design to our own Vcore design. The thermal design current (TDC) was 116 A, while the maximum current (IMAX) was 395 A. The test data shows that the D-CAP+ controller enables a faster load transient response, which translates to significant MLCC savings vs. the CPU vendor reference design. Table 1 summarizes the results. The D-CAP+ control solution still meets the CPU overshoot and undershoot specifications while eliminating 42 MLCCs and >700 µF of output capacitance. 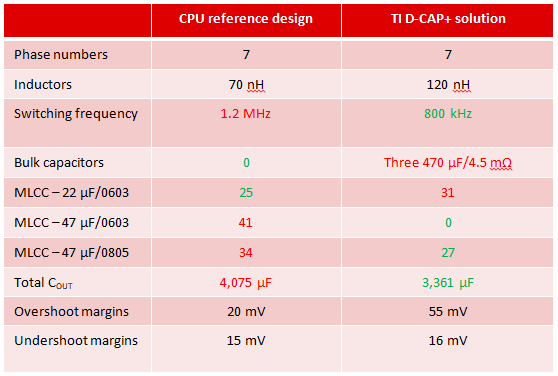 The Table 1 comparison is applicable to any D-CAP+ control-mode voltage regulator vs. competing regulators. MLCC shortages are not going away anytime soon. If you want to reduce the MLCC count in your design bill of materials so that you can get new projects to market faster, consider using TI’s D-CAP+ controllers, converters and modules. Use TI’s buck controllers quick search tool.